Michael O Neill is a journalist with SportsNewsIreland who is very supportive of women in sport. He sent me some thoughts on his time at the European Women’s Boxing Championship in Rotterdam at the weekend. I was fortunate enough to be covering the semi-finals and finals in Rotterdam and it really was a great occasion. Fantastic atmosphere both days I was there. A “sell out” crowd of 2,500 at the TopSport arena. 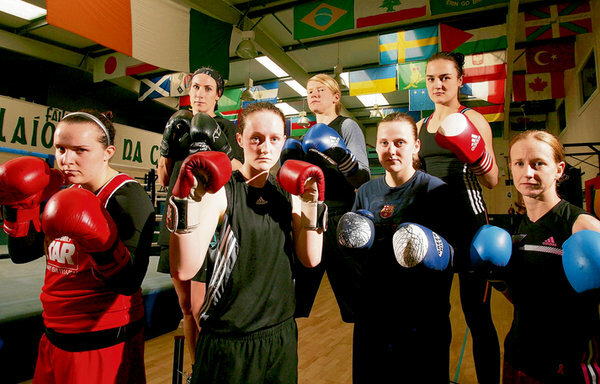 And a superb advert for women’s boxing with several notable performances. I’ve never seen Katie (Taylor) look so relaxed before a bout and naturally she was tremendously happy afterwards. She must be odds-on now for the Irish Times/Irish Sports Council “Sportswoman of the year” award. "We studied all of Ochigava's fights out here this week and the important thing was that Katie remained patient. The Russian girl wanted her to come forward but Katie stayed composed and implemented the tactics,” Pete who is Katie’s father and trainer said. "We had to hold her back at one stage as she wanted to go for her, but that would have played into her hands." I must say that Ochigava was very gracious in defeat and smiled and chatted happily after the bout. The Russian coaches were less pleased and could not understand at all what happened to Ochigava. Their many supporters in the audience were really shocked. I have to say I think that Ochigava was physically fit but psychologically in far from the right frame of mind for such an important contest. Two other points I think are relevant are that Ochigava has been out of action for more than nine months due to a serious knee problem and she is not in my opinion a natural 60kg lightweight. 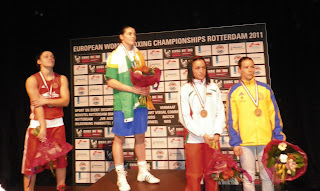 Her two world championships have been at 51 and 54kg. Sure she will be in the mix for the Olympic qualifiers and the London 2012 Games if she qualifies along with Taylor. Olympics: But Taylor’s main opponents (for the gold medal) may well prove to be Gulsum Tatar of Turkey and the USA’s Queen Underwood. Also maybe the British entrant who could be Chantelle Cameron or more likely Natasha Jonas. It appears there will be a massive Irish support for Taylor since it was vastly easier to get tickets for the women’s bouts than the men’s. As far as the rest of the Irish are concerned some fine performances. We will be hearing a lot more in next few years of Co Mayo youngster Katie Rowland. True she had a heavy defeat here by Nikki Adams (UK) but the latter is the World No 2 and now the European champion. Rowland shows real promise for the future, a point that Peter Taylor was quick to make in his capacity as one of the Irish coaches in Rotterdam. Vastly easier? I wish! I have tickets for the semi final round but not for the finals. Gutted. @Emmet - still at least you are going! and you never know what kind of horse-dealing could pull out a few final tickets at the last moment. Well fingers crossed. I'm hoping to make use of a friend's couch while there, he lives and works in tha part of London where the Games are on. The only tickets I have at present are for the semis, as in for any event, hoping to acquire one or two more between now and then.